In 19th century Iran, Anahita is coming of age and must soon be married. The local Khan would ahve her hand and alternates gifts and threats to win it. But Anahita's heart is restless and she wonders about kind teacher Reza, local boy Dariyoush, or a mysterious stranger who seems to understand her heart. 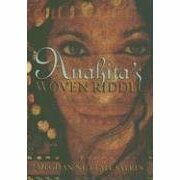 To help her choose between them, she decides to pose a riddle in her woven qali (a wedding rug) that each suitor must attempt to answer. Starting with the tired plot device of the historical girl with an anachronistic opportunity to choose a mate for love (rather than having one imposed on her), we are on pretty familiar plot ground throughout this book. What does stand out is all of the rich historical/cultural detail (so much so, in fact, that the book comes with a study guide!). This shows a tremendous amount of research went into the book, but the story itself does not quite hold up to it. Beautiful, but ultimately unsatisfactory.